We have been slowly repainting the rooms in our home. It has been a long process and we are not finished yet. Now my husband's busy season has hit so we will not be able to do any more until at least late spring. If you knew what my trimming out looked like you would surely understand why everything is at a standstill. Believing that we would get it all done, I had taken down all the old decor in all the bedrooms months ago. I have one room in particular that looks very bare and lonely. It is the room that the girls use when they are here. The old stuff is so faded and out-dated that I did not want to put it back up even for a few months. So, I decided instead to spend a little time giving the room a face lift. My goal is to freshen the room and make it a pleasant place while spending no more than twenty dollars. So far, I have remade an old chenille spread to fit the daybed and taken an old framed dry erase board to remake into a picture board. 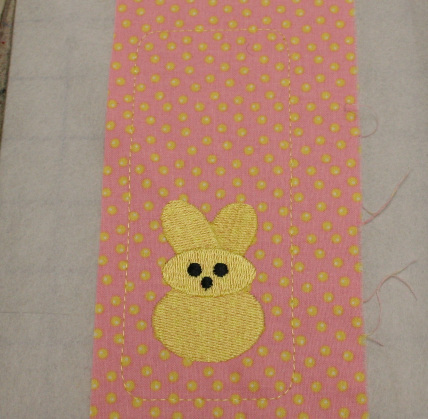 Today's pillow is the first of a group of projects using machine embroidery. An old pillow from my daughter's dorm days and a couple of leftover fat quarters from a baby quilt are the basis of this makeover. 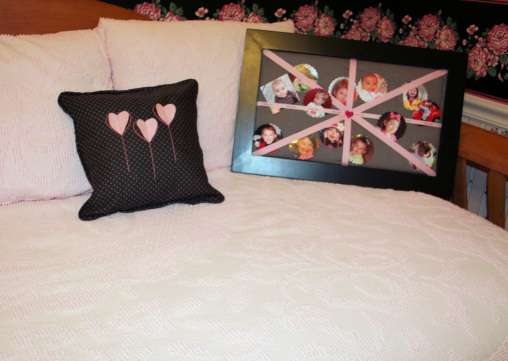 We reused the pillow form and piping cord from the old pillow. I spent 23cents on a rectangle of felt. - Cut Two squares 13" X13"
1. Hoop stabilizer in a 5" X 7" hoop. 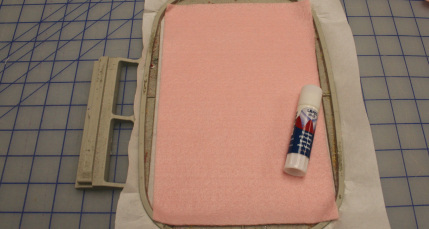 Using a little adhesive on the corners press the felt rectangle on top. 2. Embroider the heart pattern design. 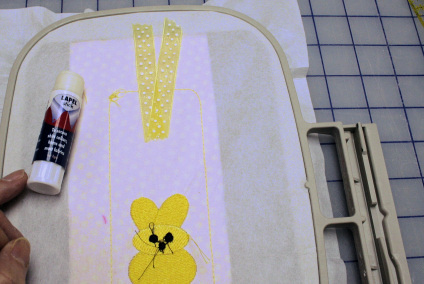 Remove from the hoop and cut out the heart shapes just inside the stitching. Set aside. 1. Hoop stabilizer in a 6" X 10"hoop. (I also made a two heart deisgn that fits in the 5" X7" hoop. It is included in the download) Using a little adhesive around the edges center one 12" square face up and press in place over the stabilizer. 2. Embroider the first two runs of the first heart. (I made two so it would stand out better.) If desired put a small strip of adhesive down the center of the backside of the heart. Press it into the embroidered heart shape. Embroider the third run. Repeat for the remaining two stand up heart designs. Set aside. 2. With wrong sides together fold and press lengthwise. Beginning 2" from one end insert piping cord inside along pressed line and pin fabric closed. Using a quarter inch foot sew closely along the cordeing to enclose the piping cord. 3. Place the pillow front face up on a flat surface. 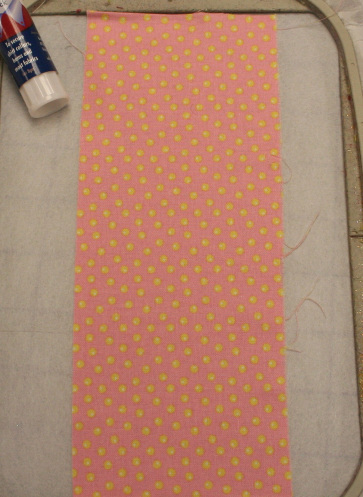 Beginning on the bottom edge pin the cording matching the raw edges and easing the corners. Baste in place, overlapping the cording ends and folding the excess fabric down below the raw edges. 4. Lay the front fabric aquare face up on a flat surface. 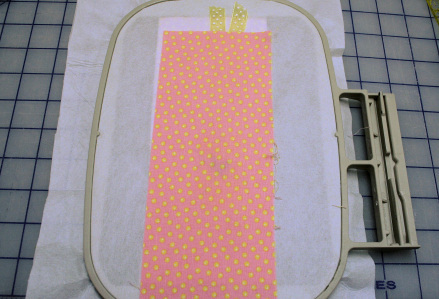 Lay the back fabric square face down on top aligning raw edges of all the layers. Pin in place. 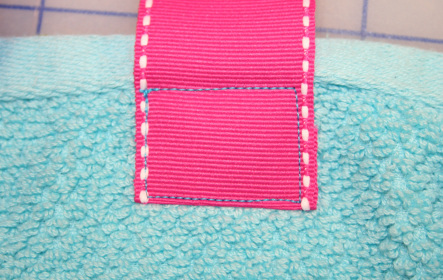 Using the quarter inch foot sew all around close to the sandwiched cording leaving a 10" opening along the bottom. 5. Turn right side out. Insert the pillow form. Whip stitch the opening closed. A simple and cute accent pillow. If cording is not your thing leave it out of the project. it will still be a cute accent for a girl's bedroom. You can download the files for the stand up hearts pattern, the three heart design and the two heart design here. 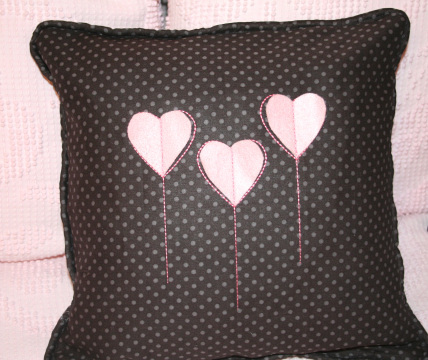 Even if you are not making pillows these stand up hearts are quick and easy. 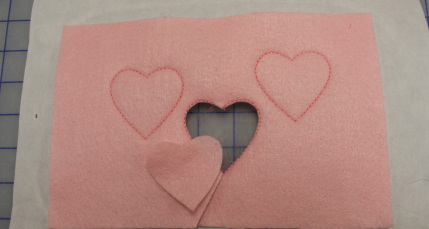 Put them on a valentine card or a gift bag Embroider just one on a bookmark or nail file cover. I'm sure you can think of even more creative ideas. I hope you enjoy them.